We have added a link to every Lodge in Alberta click on the address and you will find a google map click on the Lodge name and you will be taking to the Lodge Web Site if they have one. If you would like to add a link to this page please send your link to our Webmaster. 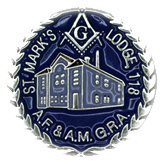 We at St Mark’s hope this page helps you to find the Lodge information you are looking for. Grand Lodge of Alberta - Ancient Free and Accepted Masons. Grand Lodge of Alberta - Ancient Free and Accepted Masons - Alpha District. Grand Lodge of Alberta - Ancient Free and Accepted Masons- Athabasca District. Grand Lodge of Alberta - Ancient Free and Accepted Masons - Battle River District. Grand Lodge of Alberta - Ancient Free and Accepted Masons- Beaverhills District. Grand Lodge of Alberta -Ancient Free and Accepted Masons - Calgary-Highwood District. Grand Lodge of Alberta - Ancient Free and Accepted Masons- Central District. Grand Lodge of Alberta - Ancient Free and Accepted Masons - Chinookarch District. Grand Lodge of Alberta -Ancient Free and Accepted Masons - Dinosaur District. Grand Lodge of Alberta- Ancient Free and Accepted Masons - Lakeland District. Grand Lodge of Alberta- Ancient Free and Accepted Masons - Mighty Peace District. Grand Lodge of Alberta- Ancient Free and Accepted Masons - Northern Lights District. Grand Lodge of Alberta-Ancient Free and Accepted Masons- Palliser District. Grand Lodge of Alberta-Ancient Free and Accepted Masons - Phoenix District. Grand Lodge of Alberta-Ancient Free and Accepted Masons - Yellowhead District.